U.S. Rockers Crown Of Thorns have arguably had mixed fortunes with their half-dozen or so albums since the release of their classic debut back in 1993. 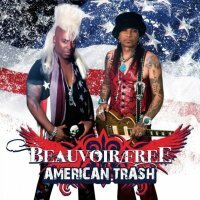 Guitarist Micki Free left the band a couple of years later whilst singer/guitarist Jean Beauvoir has carried the COT banner sporadically up to the present day. Rumours of a Beauvoir/Free reunion started early in 2013 and has been eagerly awaited by lovers of that iconic self-titled record. Well, the pair have finally gotten down to recording a new album together and (thankfully) the results have been well worth the wait! If the intention was to recapture the old COT sound then they have hit the nail on the head right from the first seconds of opener 'Angels Cry'; it's a driving Rocker with Free's raw guitar and Beauvoir's urgent vocals along with distinctive melodies and a huge chorus that is bolstered by underlying keys. Both the straight-ahead Sleazy title-track and adrenaline-fuelled 'Shotgun To The Heart' also Rock hard yet with melody, whilst 'Whiplash' even adds a touch of AC/DC to the mix. Big riffs also adorn the menacing verses of 'Morning After' and 'Cold Dark December', both tunes turned on their heads by lighter choruses with acoustic guitars and keys. But elsewhere, things get a little Poppier without losing the dynamic qualities of these men at their best. 'Just Breathe' is a monstrous keyboard-led ballad with an emotional chorus and a great guitar solo, 'It's Never Too Late' is a full-on AOR Rocker with lush harmonies and there are hooks abound on the catchy Pop Rockers 'Never Give Up' and 'She's A KO', with the typical COT drive of 'There's No Starting Over' to bring up the rear. The pair co-write and co-produced 'American Trash' with Free handling most of the guitars and Beauvoir playing everything else and in doing so they've done a fine job of recreating the sound and atmosphere of that COT debut. The album flows beautifully with all the elements you would want, bristling with enthusiasm, energy and power. All that's left now is for the word to spread and Beauvoir/Free to come over and play these wonderful songs live.